Wow, what a compliment! 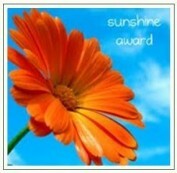 Thank you to the blogger who nominated me! I have so enjoyed writing these thank you’s every day. I could not be more tickled that there are people, besides my family and friends, who have found my words “inspirational”. Now I will pass the sunshine along to some others! 5. Link to your nominees and let them know you nominated them. 6. Answer the 10 questions at the bottom and create 10 questions for your nominees to answer. 1. If you could live anywhere in the world, where? Here, in Rhode Island. I love where I live. I am close by to family and friends. I can take a quick drive to be in the mountains or at the beach. Most of all I think I love the change of seasons here in New England; so I’m stayin’ put. 2. Is there something that scares you? Heights and bridges. Crazy, probably no rational reason for it, but there it is. I wanted to find a way to acknowledge people who’ve somehow impacted who I am and what I’ve become. Perhaps because I turned 50 this year. Hmm, not sure. College graduation was a big one. People who overcome challenges. More importantly though, my family–every one of them! 6. You are a superhero. What are your powers? Ever; there are a couple both my Chris Bohjalian: Water Witches and The Double Bind; and if I can pick one more of his it would be TranSister Radio. 8. If you they made a movie of your life and you got to pick the lead to play you…who would you cast? I don’t know how I could pick anyone but my favorite actress, Julia Roberts! 10. What’s your ideal relaxation spot? My new porch swing that my husband made me this week! 1. What famous figure, living or dead, would you like to share a meal with? 2. If you were an instrument in an orchestra, what would you be? 3. What is your favorite Ben and Jerry’s flavor? 4. Favorite way to travel: plane, train, or automobile? 5. Starbucks or Dunkin Donuts? 6. How do you “pay it forward”? 7. What must you have on your iPod? 8. Why do you blog? 9. Where do you go when you want to get away? ← Husband, Father, Grandfather, Uncle, Brother-in-Law! Congratulations on the award, and thank you for including me.